Anthem Strong Families (ASF) is helping Dallas youth to succeed with careers! 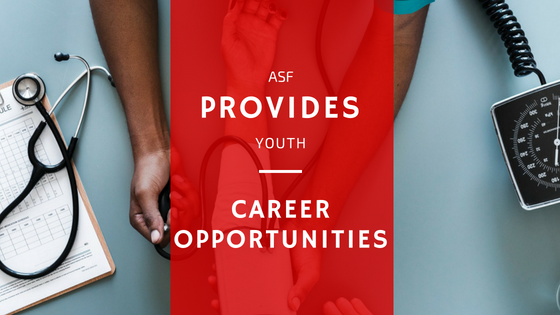 ASF along with 13 other collaborators and stakeholder groups are meeting a growing need in Dallas to prepare under-resourced and disenfranchised youth with necessary job and life skills to obtain careers in the healthcare industry. This innovative public-private community initiative called, Step Forward is a response to the JP Morgan Chase Study, Strengthening Dallas/Fort Worth: Building a Middle Skill Pipeline to Sustain Economic Growth and Expand Opportunity. The report identifies a significant need for qualified middle-skills employees in the healthcare industry. The model also provides a Return on Investment (ROI)-centric solution to address the challenges identified in the Chase report. “We, along with our strategic partners are preparing Dallas youth to work as Patient Care Technicians,” says Anthem Strong Families, Founder and CEO, Cosette Bowles. “Our aim is to strengthen families and communities and in order to do so we absolutely must address why our youth are unemployed and give them a hand up out of hopelessness. We know and data supports that a working family has a greater opportunity of transforming out of poverty but it’s not just about getting a job. It’s about finding a career for your life,” Bowles says. The transformative ASF model provides intensive case management, mentorship, problem solving, Individualized Life Work Plans and helps participants to improve self-efficacy and executive function. ASF recognizes the importance of four interrelated factors critical to moving under-resourced individuals from a life of survival to stability. Opportunities for both work, life and family changes. The ASF model delivers all four.